It's that time again Las Vegas Cowboys and Cowgirls! 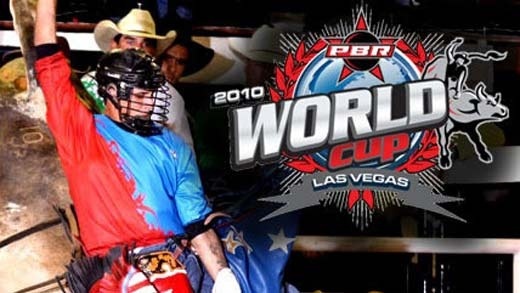 The PBR is back in Las Vegas for the 2010 PBR World Cup Finals. The boots are shined up, the bulls are rowdy and ready, and the riders are anxious to show off their dominating riding skills. This event determines which bull rider can hang in there for that extreme 8 second ride as they try and stay atop a wild and moody horned beast giving its best effort to dismount its rider. "It's a big tourist event for Las Vegas and it's a big support for us" says bull rider Austin Meier. Every year the PBR holds its biggest event right here in our backyard. People from all over the world who enjoy the anticipation and mayhem of professional bull ridingfind their way to Vegas. The huge economic boost that Las Vegas receives is much needed in our struggling town. Thousands of fans find their way to Sin City pumping it full of tourist dollars. "Of course Las Vegas is exciting" says mother of a bull rider, Sue Kinsolver. Tourist with a love and passion for professional bull riding wait in anticipation every year for the PBR finals to roll around and give them a legitimate reason to flock to Las Vegas. Local businesses benefit from the sea of PBR fans that need places to stay, eat, and shop while in town. As the time gets closer for the official event on October 23rd 2010, the crown of fans is expected to grow bigger. "I remember it was crowded it was packed here last year" says tourist Kevin Hall. Las Vegas prepares for the on slot of fans that crowd into the city every year anticipating a strong financial boost to the local economy. The event takes place on October 23rd 2010 at the Thomas & Mack Center.